In his 2013 State of the Union address, President Barack Obama made a historic pledge to provide universal, high-quality pre-K education to our nation’s children. He chose to make this one of his administration’s priorities with good reason: Early childhood education has myriad benefits, including better, more equitable long-term outcomes for children of divergent economic backgrounds. Moreover, investments in these programs help cultivate a future workforce, secure long-term economic competitiveness, and develop our nation’s future leaders. Universal high-quality pre-K and child care would also throw a much-needed raft to families across America that are struggling to stay afloat while footing costly child care bills, missing work to provide care, or sending their children—our nation’s future innovators and workforce—to low-quality care centers. 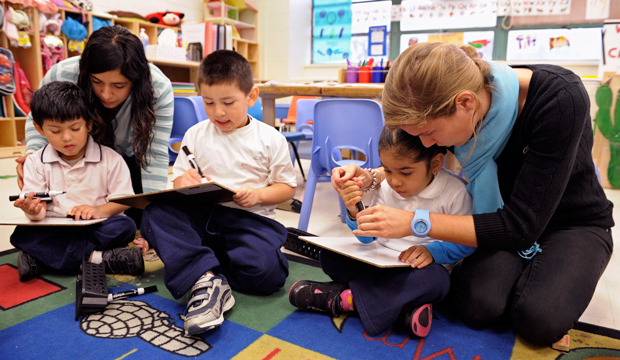 Only 6 out of 10 kindergarten programs in America are open for full-day enrollees. Increased funding for Head Start and child care subsidies together can encourage extended hours to better accommodate parents’ work schedules. Enabling more women to work by improving access to child care can help mitigate the gender wage gap and reduce a mother’s likelihood of going on public assistance. Lower costs and increased access to child care can lead to a decrease in the number of women leaving employment and an increase in the rate of entering employment, enabling mothers to keep working when they want or need to do so. In addition to the positive long-term impacts that high-quality preschool and child care have on children and the economy, these programs provide important benefits to working parents, especially working mothers. The prohibitively high costs of private child care and the dearth of quality, accessible public providers means that parents are often left to choose between the lesser of two evils: low-quality care or forgoing needed pay to stay at home and care for a child themselves. What choices do working parents have? Most families currently have three options for securing child care. First, parents can stay at home and care for their children themselves. But this is increasingly difficult, as most families now rely on two breadwinners to stay above water. Moreover, mothers are more likely than fathers to take time away from paid work to care for a child, which can exacerbate mothers’ lifetime earnings gap. Second, parents can pay for child care out of pocket. But this approach is very costly for families, eating up 35.9 percent of a low-income family’s monthly budget. The third option for families is to use federal- or state-funded child care, but access to any publicly funded program, let alone a high-quality program, is very limited. Nationwide, nearly three in four children are not enrolled in a federal or state-funded pre-K program. Understanding the drawbacks, risks, and shortcomings of each of these options—and especially how these limited choices negatively impact families and working mothers— makes clear the need for increased investment in high-quality pre-K and child care. We explore each option in detail below. Fifty years ago suggesting that one parent stay at home and forgo paid employment to provide child care would have made plenty of sense both culturally and economically. This was largely because families could live comfortably on one breadwinner’s income and also because women had traditionally been relegated to the domestic sphere. But in the past 40 years, due to both social advances and economic changes, American families have undergone a dramatic change. Leaving the workforce to provide care today, even temporarily, carries real risks. The majority of parents now work, regardless of the age of their children. Parents are workers and workers are parents, both out of necessity and preference: 70.5 percent of mothers are in the labor force, including 64.8 percent of mothers with a child under the age of 6. That’s in large part because many families in today’s economy rely on two incomes in order to pay the bills. In fact, the only married-couple families that have seen real income growth over the past 30 years are families where both parents work. Given that the cost of child care may be nearly as large as one parent’s entire salary, a worker’s choice to leave the workforce or work part time so that his or her family doesn’t need to cover those costs may appear to be an economically rational decision. And while there are mothers who choose to stay home for other reasons, short-term economic pressures are often part of the equation. But this choice is not without consequences. Women are more likely than men to cut back their work hours or leave work entirely to care for their children. Unfortunately, this puts them at an economic disadvantage in the long run. Leaving the workforce, even for less than a year, can have long-term negative consequences for women’s careers and lifetime earnings. The fact that women are more likely to take time out of the workforce to provide unpaid care for their children is part of the reason why there is a persistent gender wage gap in this country—10.5 percent of the differences in men’s and women’s earnings can be attributed to labor-force experience. When women work less, they pay less into Social Security over a shorter period of time, which is one of the reasons why retired women are more likely to live in poverty than retired men. Access to child care is essential to a woman’s ability to participate in the workforce, and a lack of access to child care affects the work-family balance of both women and men. Women need to have the ability to make the choices that are best for them and their families in both the short and long term, and greater national investments in child care and preschool programs could help remove some of the constraints that may push mothers toward decisions that have negative economic consequences for them and their families down the road. It would make quality care more affordable for American families and support mothers’ employment. Using part of a family’s total income is a second but equally problematic option for securing child care. In recent years the costs of care have skyrocketed, placing a disproportionate burden on families’ budgets. The fact is, for millions of families across the United States, paying for high-quality private child care is an economic impossibility. The story becomes even bleaker for mothers who are living below the poverty line. As Table 1 shows, 26 percent of working mothers in poverty pay for child care out of pocket, and those expenses eat up nearly half—42.6 percent—of their monthly wages. It is vital that these women have work support, since they are more likely to be single parents and since seeking paid employment is required to have access to certain governmental benefits. Employment is also an important pathway into the middle class, but when child care is as expensive as it is, it places a disproportionate burden on the mothers who can least afford it. While paying for child care out of pocket may be simple and affordable for wealthy families, it is not truly an option for many Americans, especially young single mothers. A final option for accessing child care is utilizing programs funded or subsidized by states and the federal government. Unfortunately, while it may seem as though this must be a viable option for families who do not want to lose a co-breadwinner’s earnings or for those who can’t afford private care, the United States still has a long way to go on this front. Publicly funded programs are helpful for some low-income families and mothers, but access is too limited and quality is often far too low. Unless we expand and strengthen these programs, they will continue to not be a viable option for many working parents. There is a great deal of empirical evidence that shows how higher child care costs have a negative impact on mothers’ employment. Mothers are more likely to leave employment and less likely to start new jobs when the costs of child care are high. It is also difficult for parents to keep their jobs when they do not have access to consistent quality child care. A study conducted by Jeffrey D. Lyons in North Carolina found that about one in four families who were on a waitlist for child care assistance either lost or had to quit their jobs while they waited for an opening. A similar study in New York City found that more than a third of families on the child care assistance waitlist either lost jobs or were unable to work, and one in five had either missed or been late for work because of their child care problems. Perhaps even more alarmingly, a quarter of families on a child care waitlist in Minnesota had to rely on public assistance in order to make ends meet while waiting to access child care subsidies. This data was all collected before the recession, and since jobs are even scarcer now and family budgets stretched even thinner, there is reason to suspect that the current situation is worse than what these numbers portray. Evidence from other countries shows that child care subsidies increase women’s labor force participation, help them obtain more stable jobs, and increase their income. While interventions in the United States have been much more modest by international standards, there is ample evidence showing that child care assistance helps working moms. Families who receive child care support are more likely to be employed and have longer employment spells that families who do not receive support. The effects are particularly strong for single mothers, who are nearly 40 percent more likely to maintain employment over two years than those who do not have help paying for child care. The benefits of high-quality pre-K and child care are enormous. It is an essential way to close the achievement gap between children of different economic backgrounds and prepare them for kindergarten, primary school, and beyond. Decades of research have also shown that investing in our children at an early age pays social, educational, and economic dividends over the course of a child’s lifetime. Children deserve access to affordable high-quality education that promotes school readiness, regardless of their family situation. We shouldn’t forget that affordable high-quality child care is also essential to parents’ abilities to balance work success with family responsibilities—a goal that every parent deserves to easily achieve. President Obama’s preschool and child care plan will strengthen families and make them more economically secure while also reducing inequality and improving educational achievement in this country. Sarah Jane Glynn is a Senior Policy Analyst at the Center for American Progress. Jane Farrell is a Research Assistant for Economic Policy at the Center. Nancy Wu is an intern on the Economic Policy team at the Center.